Any vehicle parked in a university parking facility without a permit is subject to ticketing. Before parking a vehicle on campus, drivers are advised to read all signs carefully and abide by the posted regulations. To avoid citations, contact the Parking Services Office to register your vehicle. After-hours questions may be addressed to a parking attendant, parking officer or other member of MUPD. No individual or department may grant parking privileges on university property or issue permits without the consent and written approval of the Parking Services administration. Handwritten or typed notes placed on a vehicle will not be honored. Counterfeiting, altering or the possession and/or use of a lost, stolen, voided, counterfeited or altered permit will subject the individual to a citation and/or disciplinary action. Parking permits and gate cards are issued to eligible people for specific vehicles. Selling, lending or otherwise transferring a parking permit or gate card to a person other than the registered permit holder is prohibited. Transferring a permit from one vehicle to another may only be authorized by the Parking Services Office. Using your gate card to allow others access to a parking facility is strictly prohibited. New or different vehicles will require duplicate permits. Bring old permits to the Parking Services Office to receive replacement permits. All parking permits must be properly and visibly displayed in accordance with the instructions provided when the permits are issued. The responsibility for the proper display of a parking permit lies with the holder of that permit. Failure to properly display any parking permit will subject the holder to a citation. Information provided to obtain a parking permit or authorization must be correct and current. If there is a change in information, such as the license plate number, it must be reported to the Parking Services Office immediately. A permit will be honored only in the parking areas for which it is designated. Entrance signs posted at all university parking facilities clearly indicate the permit(s) required for parking in that area. All vehicles on university property should not exceed the speed of 10 miles per hour. Because of the high number of pedestrians, extreme caution should be used when operating a vehicle on campus. Permits and gate cards must be returned to the Parking Services Office to cancel parking. No refunds will be given and payroll deductions will continue unless permits are returned. Credit or refunds are not given for short-term absences such as days off or vacations. The Parking Services Office must receive prenotification of any extended absence to provide parking fee adjustments. Parking is permitted only within marked spaces. Every legal space within the university parking system is clearly marked. Any vehicle occupying more than one space, or extended beyond the marked space, is in violation of parking regulations and subject to a citation. Back-in parking is not allowed in either of Marquette’s parking structures because of the potential risk for pedestrian injury and vehicular damage. Barriers and gate arms are present in university parking facilities to restrict unauthorized access. An open gate arm is not an invitation for unauthorized parking. If a gate arm mechanism is not operating properly, report it immediately to the Parking Services Office or MUPD. Unauthorized removal or damage of a gate arm will result in the issuance of a citation, disciplinary action and restitution. Use of all university loading areas must be authorized by the Parking Services Office. To avoid a citation, please call the Parking Services Office at (414) 288-6911 as soon as you arrive on campus to load/unload your vehicle. After hours, MUPD may be reached at (414) 288-6800. Loading areas are restricted for loading/unloading at all times, including evenings and weekends. Because of space constraints, abuse of this privilege will not be tolerated. Special events and parking facility maintenance may temporarily affect parking assignments. Furthermore, drivers arriving on campus during peak parking hours may occasionally experience difficulty in finding a parking space. If there is not an available space in your assigned parking facility, you will be routed to the nearest available area. All university malls are pedestrian zones; vehicular traffic on malls is restricted. Exceptions must be approved by Parking Services by calling (414) 288-6911 during business hours or MUPD at (414) 288-6800 after hours. 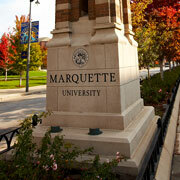 Parking on the Marquette campus is intended for university guests and business purposes only. Marquette is not responsible or liable for any damage to and/or theft of any vehicle, its equipment or content while the vehicle is parked on university-owned property. Leaving any animal unattended in a vehicle in a university lot is strictly prohibited. The Wisconsin Humane Society will be called for violations and animal rescues.